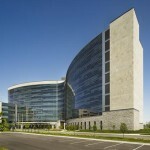 Owensboro Hospital is one of the nation’s top 10 largest healthcare projects. Healthcare Technology Corporation is proud to have partnered with Turner Construction and HGA Architects on this state-of-the-art project. The high activity seismic zone of the hospital necessitated the need for a safe and reliable method for attaching the Berchtold boom and light equipment to the steel frame building structure. Healthcare Technology Corporation specified our header-mounted 400 Series equipment to meet the stringent seismic and deflection requirements. Accu-Mount Support Systems were supplied for all of the Berchtold surgical boom and light equipment required in the 16 OR suites, as well as the mounting systems needed for the 41 composite deck mounted exam lights. In addition, 8 specially designed spanner mounts were supplied for the Galuxy Medical recessed birthing lights to allow the lights to be safely and easily installed directly beneath a 48″ wide HVAC duct.